Lammas,(LA-mas) or "Loaf Mass" (Anglo-Saxon), also known as Lugnasadh (Irish Celt), Lùnasdal (Scottish), Calan Aust (Welsh), Lugunassatis (Gaul), and Feast of First Fruits, is celebrated on or around August 1st. 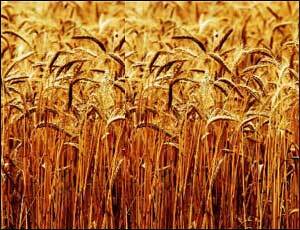 Lammas celebrates the first of the major harvest festivals of the year, that of grain or "Corn". In England during the medieval era tenants were required to present to their landlord the first of the freshly harvested wheat crop. The first corn from this harvest was baked into a ceremonial loaf and given as an offering to the Gods.The last sheaf of corn was not consumed but kept back and made into a effigy to represent the spirit of the corn and the harvest, sometimes called John Barlycorn. The effigy was placed at the center of the feasting table and then next year when the fields are being prepared for the sowing of new crops, it was ploughed back into the soil so that the spirit of the sun and the corn did not die. Among pagans, (especially those with Celtic roots), the most common name for this holiday is Lughnasadh, (loo-na-sa), in honor not of the God Lugh, but that of his foster mother Tailtiu. Tailtiu died while clearing the plain of Breg in County Meath for agriculture. Lugh instituted funerary games called Áenach Tailteann in her honour, which continued to be celebrated as late as the 18th century. The daylight is now visibly waning as the mature Lord of the Forest and Field becomes more the Wise Sage and his power awareness begins to pass from without to within. The Pregnant Mother Goddess rules beside Him as they both bask in the bounty of Nature in this, the beginning of the harvest season.